In the rough and tumble world of beer blogging, it's easy to become jaded. That's why it's sometimes good to throw caution to the wind and take a flier on something obscure, like this fanciful New Zealand brewing duo who have a punnily named brewery and take some ridiculous chances with their beer. Case in point: Rex Attitude, a beer with an absurdly simple recipe. No fancy specialty grains here, just a single golden malt (ok, I'm being a bit facetious here, but we'll get to that in a moment). No trendy hop blends, just 31 IBUs driven by the mild character of Willamette hops. No estery, phenol driven Belgian yeast monsters, just a clean fermenting US yeast. The thing that makes this beer so interesting is that that single golden malt also happens to be smoked. And not just any smoke: peat smoke. Scotch fans just raised an eyebrow. Most smoked beers burn traditional wood to get that smokey flavor - stuff like beechwood, hickory, ash, maple, and, uh, vampire stakes. But historically, you used what you had, and Scottish folks had lots of peat moss. So that's what they use to smoke their malt. These days, that malt is mostly used in service of Scotch Whisky (I'm unclear as to whether or not Scottish breweries used to use peat moss to dry their malt back in the day, but Scotch ales don't usually feature peat smoked malt). Beer Nerd Details: 7% ABV bottled (11.2 oz). Drank out of a tulip glass on 1/19/13. There's a doubled up version of this very beer called XeRRex that is supposedly just as audacious and successful, despite being a 10% monster. I must find that beer. In the meantime, I'll have to hit up my local bottle shop for their Pot Kettle Black (which they call a hoppy porter, otherwise known as Black IPA). 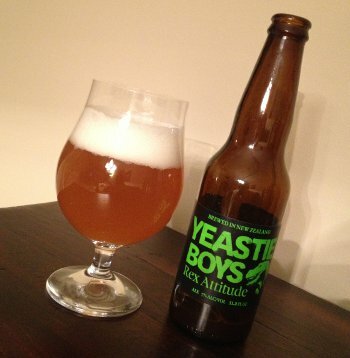 Yeastie Boys came to my attention by way of Stephen Beaumont, and I'm glad I caught that post. Yeasty Boys is a contract brewing operation, but Stephen notes: "in New Zealand, where a small population base is stretched across a long and isolated land mass, or rather, masses, that is a status without the perception issues that tend to dog it still in North America and parts of Europe. Indeed, contract craft brewing seems at times almost the Kiwi norm rather than the exception." So this is the only one of their beers I've had, but if it's any indication, these guys are worth seeking out. And thus ends Smoked Beer week. I hope you had fun, I know I did. Now if you'll excuse me, I've got a fresh box of West Coast beer to scarf down this weekend. Stay tuned. This page contains a single entry by Mark published on January 31, 2013 9:17 PM. Fantôme La Dalmatienne was the previous entry in this blog. Adventures in Brewing - Beer #10: Fat Weekend IPA is the next entry in this blog.